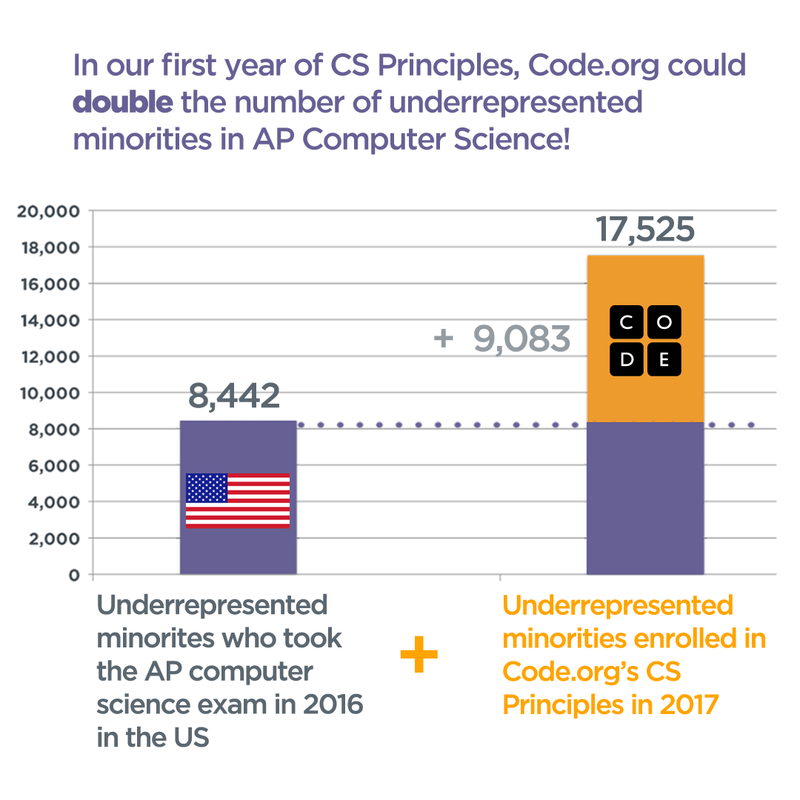 Code.org, which started offering an advanced placement computer science principles this school year in partnership with The College Board, could more than double the number of underrepresented minorities enrolled in AP computer science classes across the nation. During the last school year, 8,442 underrepresented minorities (black, Latinx, American Indian/Alaska Native, Native Hawaiian/Other Pacific Islander) took the AP Computer science test in the U.S., according to The College Board. For the sake of comparison, 15,913 Asian students and 26,698 white students took the AP CS exam last school year, while just 2,027 black students and 6,256 latinx students took the exam. This year, with the addition of the new CS class, there will be an additional 9,083 underrepresented minorities taking AP CS classes. That means there could be more than double the number of students of color (17,525) taking the AP CS exam this school year than there were last year. This is all thanks to the addition of Code.org and The College Board’s new advanced placement class called Computer Science Principles. The two organizations, which first announced their partnership in May 2015, are helping 35 of the nation’s largest school districts — particularly in urban areas — implement new CS classes. There are two types of AP classes for computer science, AP Computer Science A and AP Computer Science Principles. AP Computer Science A is problem-solving oriented and focused specifically on Java, while CS Principles takes a broader approach around the fundamentals and it’s up to the teacher which programming languages they want to use.